Launched in early 2011, Menlowe Ballet has performed fourteen successful seasons achieving critical acclaim and ardent audience response. This winter we return again to the Menlo-Atherton Performing Arts Center with performances of TRIPTYCH, May 3-5, 2019. The founders collectively recognized an opportunity to bring a new choreographic voice to the dance canvas on the Peninsula, as well as address an underserved local community in professional performing arts offerings. Artistic Director, Michael Lowe, has long been a fixture in the ballet world, most notably for his work with Oakland Ballet. Michael brings a rich history and perspective to his work - a principal dancer with Oakland Ballet for three decades, a choreographer for the company in his retirement, culminating in the Isadora Duncan Award for Outstanding Choreography for his ballet Bamboo. His unique choreographic strengths are evident in his contemporary and cultural ballets, featured in each Menlowe Ballet season. 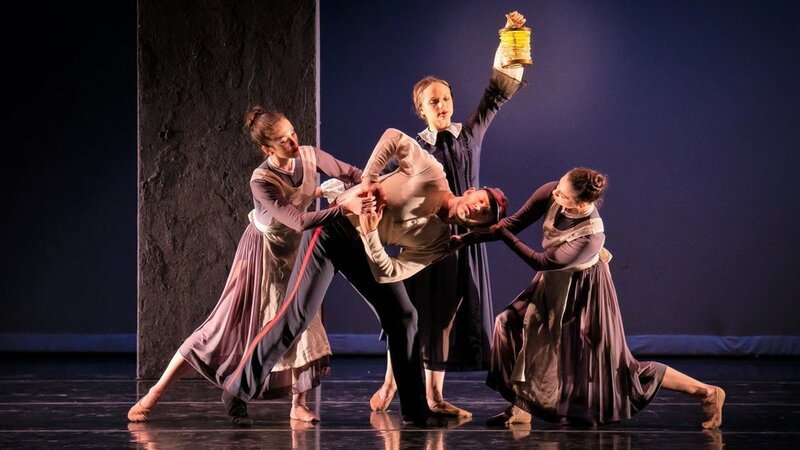 Menlowe Ballet is a professional ballet company performing work that impacts Bay Area audiences through exceptional dance and stirring, innovative choreography. The company’s repertoire encompasses cultural, classical, and contemporary styles. One of Menlowe Ballet’s core values is to continue the tradition of passing dance on from one generation to the next – artist to artist. To that end, aspiring students from Menlowe Ballet’s official school, the Menlo Park Academy of Dance, regularly perform in company productions. Since our debut in November 2011, Menlowe Ballet has dazzled local audiences with the following: eleven world premieres by Michael Lowe as well as four reprisals of his most beloved works; world premieres by renowned guest choreographers Betsy Erickson of San Francisco Ballet, Viktor Kabaniaev, and Reginald Ray-Savage of Savage Jazz Dance, Val Caniparoli of San Francisco Ballet, Gregory Dawson of dawsondancesf. Our 2016- 2017 Season marked the professional choreographic debuts of Sarah-Jane Measor of Menlowe Ballet and Ali McKeon & Stefanie Maughan, both company dancers; two reconstructed works from Founding Artistic Director of Oakland Ballet, Ronn Guidi, for which the company has been nominated for an Isadora Duncan Award for Outstanding Reconstruction, as well as two classical ballets from Founding Artistic Director of both Cleveland Ballet and Ballet San Jose, Dennis Nahat. For our ILLUME season we were honored to bring a new work from Donald McKayle, Crossing the Rubicon: Passing the Point of No Return, to our stage.